But also, I was wrong. And it almost brought me to tears today. My Dad died a little over two years ago, and as I was cleaning the house out last year, I found two videotapes in a Ziploc bag with our last name on it, but not in his handwriting. I paid little attention, as my Dad would just about videotape every thing, time shifting his VCR to watch late night stuff in the morning. I didn't have a VCR player but went over to a friend's house to get an idea of what was on them. A few minutes of watching gave me the idea, this was old photos and old 8mm film transferred to VHS containing my high school graduation, flying off to college, getting married, etc., that others had taken for him. I put them away for a while, and after seeing them again on the shelf in my closet, and some procrastination, I dropped the tapes off to get them transferred to DVD in May of this year. Calling the vendor several times to ask about my order (where was it? ), and having finally recovered the DVD and tapes which were nearly lost in the mail, I received them today. I'd figure I'd give them a look, to how good or bad the transfer was. I suppose it is as best as one could hope. The first part is still photographs transferred to DVD, the second part is 8mm film transfer to DVD. The film transfer was grainy, somewhat washed out with hairs aplenty. 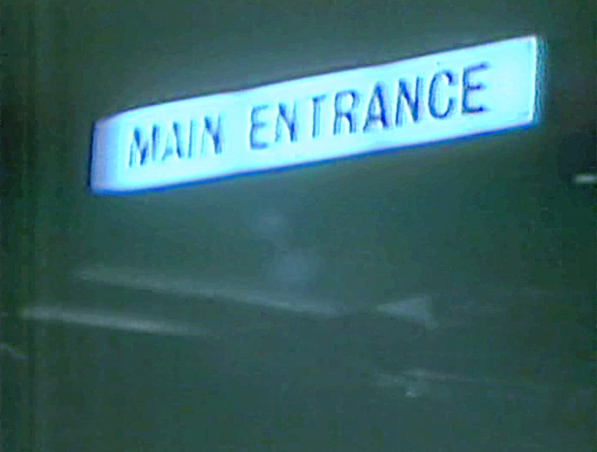 In the second part I saw some unusual night scenes, very quick and blurred, and what looked like a quick sequence inside Ford's Magic skyway tunnel. No way, it must have been a tv shot of "Time Tunnel" or something. I've been looking at so many images of the '64-'65 fair lately on this site, it must be affecting the way I'm seeing things. Next up were scenes of the Quabbin Reservoir during the great northeastern drought of the mid-sixties. It seems whoever put together this 8mm compilation must have tossed the films up in the air and re-assembled them in what ever order they fell to the ground. Then the blurriness became clear. 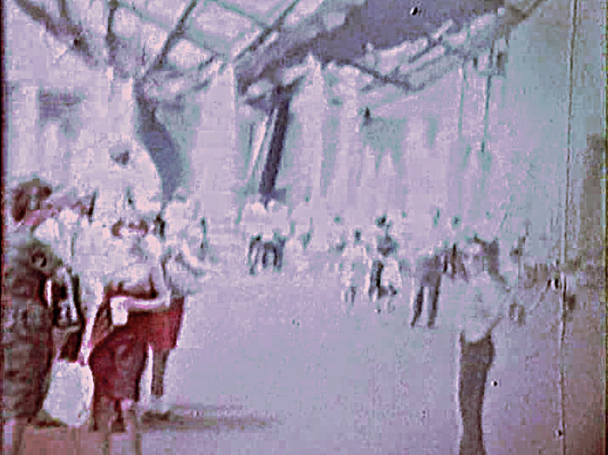 It was movies from the World's Fair and there I was in all my 8mm glory with Mom and my sister. Another shot, and it's my Dad, Mom, and sister walking away, then turning around to face the camera, with my Dad carrying the camera case. It's me taking the pictures in this case. So I was wrong about the mystery of my Dad not taking any pictures. Instead of a "now move over here in front of this building, while I take this shot", he was more of pick up the camera and shoot type of guy. 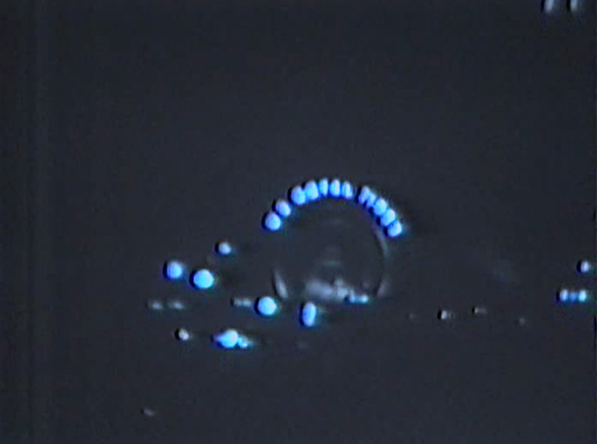 I have hardly any memories of the Lake Amusement area, and in fact thought I might have missed it, but there is aerial footage taken from the Monorail. 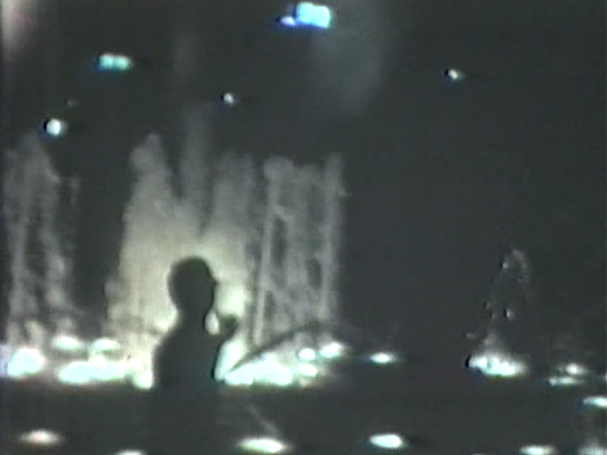 There is footage of me and my sis jumping around at night (in shadow) in front of the Unisphere, and in front of the Illinois Pavilion during the day. But the strangest thing of all, all four of us were wearing sunglasses. In most of the photos I've seen posted here, it seems hardly anyone is wearing sunglasses. 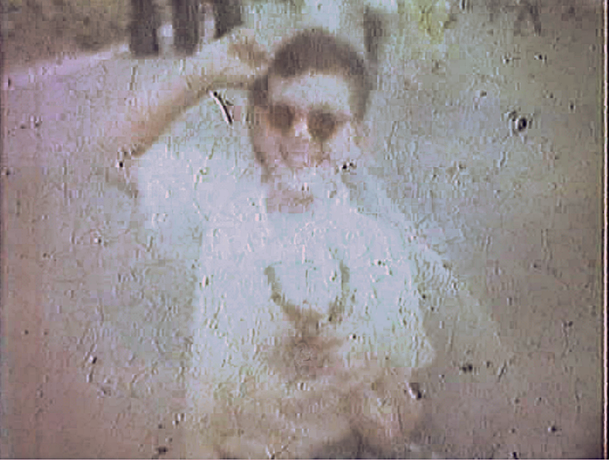 I never knew my Dad was carrying an 8mm movie camera (or historical recording device) that day. And I can't believe what I saw today. What wonderful news! I hope you share some of it with us here. This has certainly been an eventful year for you, Ray. Do any of the new images add confirmation to the one of you in the Space Park photo? That would be doubly exciting to hear. Absolutely. For me it felt like winning the lottery. Eventful. Don't get me started. Unfortunately, there are no images of me in Space Park. I guess my Dad would only shoot film when all of us were together. However, you can certainly compare what I looked like in your photo to what I looked like in these films. It's a match. Now I need someone's help here as to getting a DVD video editor so I can post screenshots. Some things and places are identifiable, and some have me scratching my head. VLC player: pause the video when you want to capture a still, then with the play window selected, type ALT-prt sc to copy the image to the clipboard. I downloaded the VLC player, and after locating the files it works. Which menu option gives me slo mo and from which can I get a screenshot? Just pause the video in VLC player first. There is no screen capture in VLC as far as I know. You have to use the Windows screen copy command: ALT Prtr sc (press and hold down the ALT key and press the prtr sc key [somewhere near the upper right of your keyboard]). This copies the active window (which should be VLC player) to the Windows clipboard. Then click on the Irfanview window to make it active, and press CTL and V to paste into Irfanview. You will probably want to crop the image in Irfanview to remove the Windows/VLC frame around the video picture. This is what drew my attention to the screen. Then I said to myself, "No way"
Is there a way to sharpen the images? (I don't expect to pull off the miracles that Bill does with slides, but is there a way to sharpen the screen captures?) I know too much can't be done, as the original source material is gone. 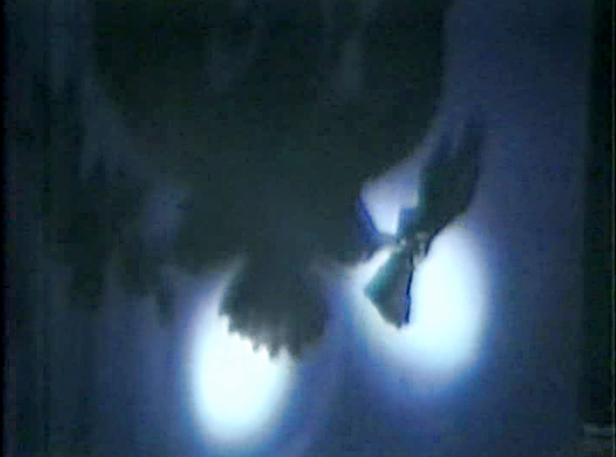 These seem to be at the same resolution as the video source, so I wouldn't resize them. However, you could crop off the black areas. 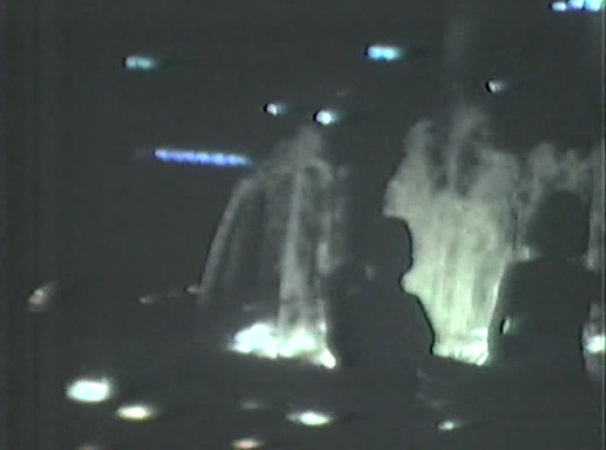 As far as sharpening, I think it would be futile, as you are seeing whatever is on the video, and there is no further detail to bring out (as there is by scanning a slide with more dots per inch). 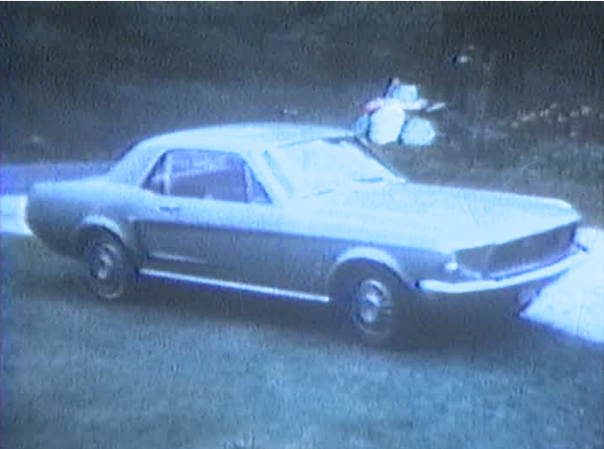 The TV crime shows where they say "enhance that" and the license plate is suddenly readable are pure fiction. I took a couple of screen shots to see what I could do with them. Your right Wayne, I don't expect to get prime rib from horsemeat. I picked the worst washed out ones just to see how much they could be fixed. Also, these are moving images, and whenever I hit pause, I got the image that appeared. I need to slow these down to just about a frame by frame rate, so I can capture the clearest images to clean up. Hey, who is that kid? Look at that kid, hands on hips. 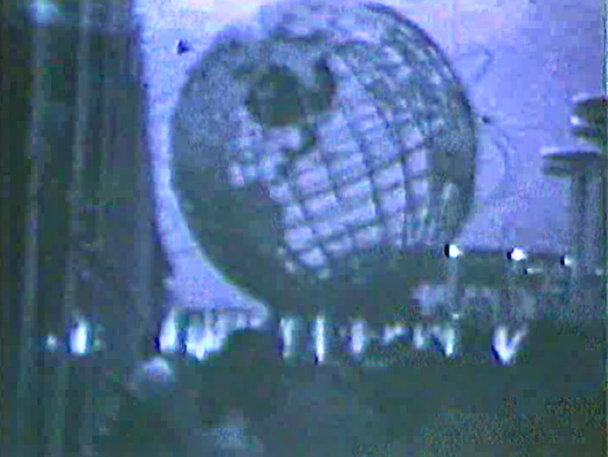 You'd think he built the Unisphere all by himself. I've been slowly able to piece together the World's Fair trip. Bus ride from Mass to Queens, visit the Fair late afternoon till night. Visit Fair on second day, leave late afternoon to go see a Broadway play. Visit Fair on third day, leave for home. I wonder what waits in the other images? One thing (besides the dirt) that contributes to the degradation is the transfer to tape, which loses some resolution. Also, when you capture a still, the shutter blur and grain variation are stopped and are much more obvious than when played in motion. Nevertheless, these are a wonderful record of the time, and you are really lucky to have them. Please do show us more! I'll post more stills from the film, but it is a slow process getting the right frame to capture. I don't know how far these new barriers extend out from the fountains today. Maybe someone who visited the park recently can tell me. Glad to hear the barriers are gone. What I don't understand is why the base looks so large (close) in the film. That can't be lens distortion? Unless, by farther out you mean closer to the base. You were standing farther away from the base, but your picture was taken with a much less wide angle lens, which visually compresses distances. 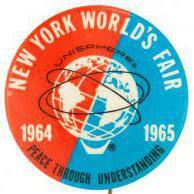 Think it might be World's Fair related? The beginning of the reel is all late evenings and night shots, taken with film not designed for low lighting. This had to be taken from the "Court of the States", as the New York towers loom in the background. Which I'm not exactly sure where this was. I'm not sure if it was the main entrance to the Fair or to a Pavilion. if you have video of the inside of the US pavilion.... You have NO idea the state of happiness of this crowd. Luckily, the rest (most) of the footage is during the day. I just noticed something in the photo above. It really looks like the spotlights were really off their focus area. I remember reading that these spotlights were really kicked around by posing tourists in front of the eagle and that the Boy Scouts (being a former) were supposed to watch the lights. Is this correct? Railing yes. Not sure about the spotlights. The railing went in for 1965. 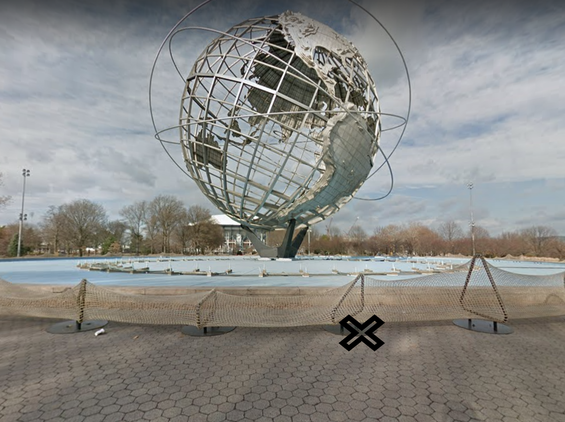 You can track all of the changes this one little area got at https://www.worldsfairphotos.com/nywf64/changes.htm - just scroll down to the United States entry. Wow. Even in the second photo (1964) in the series, the lights are abused. 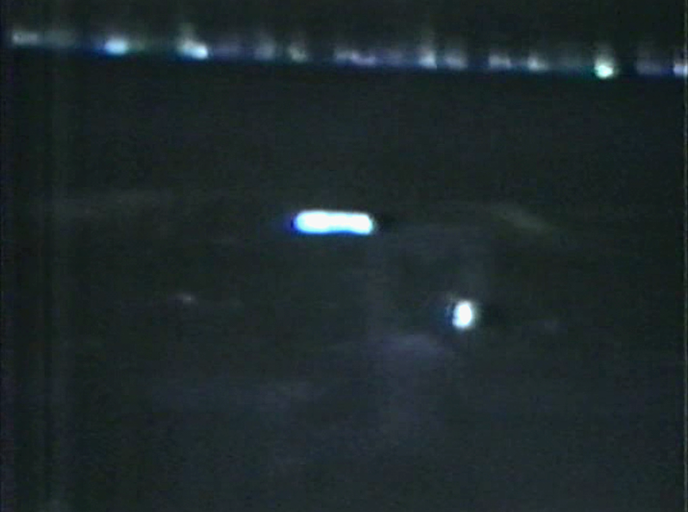 It could be this still (in the film) relates to photo #5 in this series (with the left spotlight completely gone and the middle spotlight off-kilter). You don't think damage like this would last for more than a couple days, would you?